Last week, the topic for Illustration Friday was SuperHeroes. I really have a hard time seeing myself as artistic. I WANT to be, I take classes and try, but I felt the need to expand on why he’s my hero. In 1969 the US Senate had a hearing on funding the newly developed Corporation for Public Broadcasting. The proposed endowment was $20 million, but President Nixon wanted it cut in half because of the spending going on in the Vietnam War. This is an video clip of the exchange between Mr Rogers and Senator Pastore, head of the hearing. Senator Pastore starts out very abrasive and by the time Mr Rogers is done talking, Senator Pastore’s inner child has heard Mr Rogers and agreed with him. Enjoy. 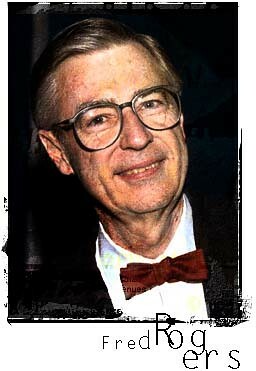 It makes me sad to know childhood friends like Mr. Rogers don’t live forever. He was a special kind of man.